Low birth weight. Low-performing schools. Poverty. When Best Start expanded beyond Metro LA in 2009, these were among the risk factors for young children, along with geographic, racial and ethnic diversity, used to determine which additional communities would become a part of the Best Start effort. 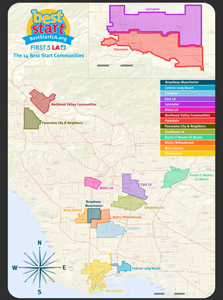 The 14 Best Start Communities were also chosen for possessing community infrastructure, community leadership and commitment to partnership with First 5 LA – all key components to community empowerment. Today, throughout the 14 Best Start Communities, parents and other participants are working together to assess and identify the core needs of their community that will best benefit families with children prenatal to 5. These needs range from decreasing child abuse and neglect, increasing social connections for immigrant parents, and raising awareness among parents of existing child care, preschool and educational services. Once these needs are identified, the partnerships work on a plan to address those issues. But there is more work to be done. More voices to be heard. More collaborations to be made. If you would like to be a part of Best Start’s effort to create effective change for young children and their families in Los Angeles County, see the map below, click on the link to your community, or contact the Best Start program officer for your community.